Cherry trees blossom near the Fairmount Waterworks in Philadelphia. Thinking of signing up for a springtime race? Saturday, April 13, is the Cherry Blossom 10K, one of the most scenic races in Philly. 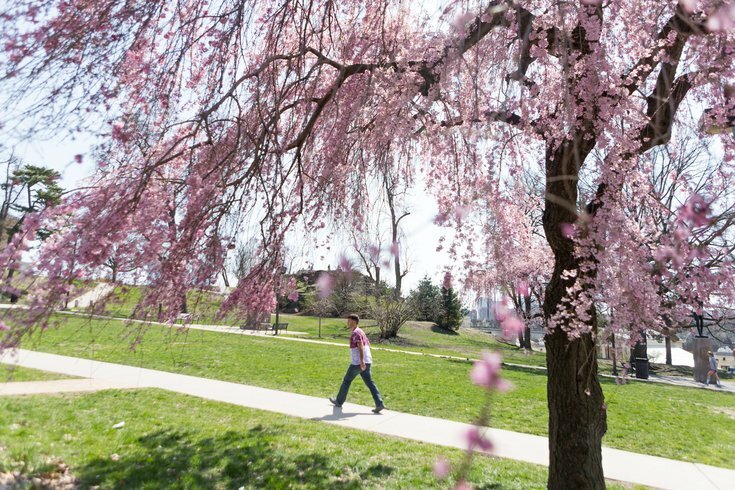 The 6.2-mile course takes runners past beautiful cherry blossom trees in Fairmount Park and offers views of Memorial Hall and Shofuso Japanese House and Garden. Registration for the 10K is $30. There's also an option to run/walk a 5K. The fee for the 3.1-mile race is $25. All participants will receive passes for free admission to Shofuso, plus a race shirt with the Cherry Blossom 10K logo. The race is one of the Subaru Cherry Blossom Festival's main events, along with Sakura Sunday (April 14). UPDATE: The race begins in front of the Please Touch Museum.